Hi everyone! In this article, I am going to mention that what heterogeneous network is. Up to now, wireless cellular networks have been deployed as homogeneous networks including macro cells that are used to ensure broad coverage by using high power transmitters and high mounted antennas. Heterogeneous networks are a combination of traditional large macro cells and small cells such as pico cells, femto cells, micro cells and relay nodes. These have different properties in terms of physical size, transmission powers, coverage areas and propagation characteristics. The answer the question of why there is a such sub-division of regions is that smaller regions (shorter ranges) allow higher user density and faster transmission rates. In heterogeneous networks, the macro layer provides wide coverage at the expense of lower average data speeds whereas small cells extend network coverage and improve network capacity in traffic hot-spot areas. 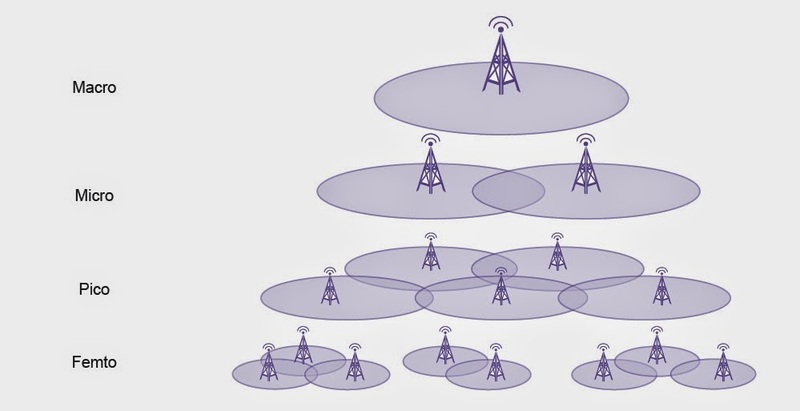 In a hetereogeneous network, small cells that can be called low power nodes are distributed over the macro cell network. Because the low power nodes are deployed over macro cellular network, wireless resources can efficiently reuse. These resources can be power, bandwidth, channels, base stations, access and rate. In addition, in such networks provide good link qualities with the end users due to the shorter distances. The reason of the good link transmission is the higher channel gains. Macro cells are outdoor base station and open to public. These are the main base station in the cell and transmitted power is approximately 20 W. For example, in the area of largest coverage, an entire city, sub-urban. Pico cells are regular base stations and open to public. They are deployed indoors or outdoors with a planned manner. They are equipped with omni-directional antennas. They have the same backhaul and access features as macro cells. Apart from the traditional macro cells, they have lower transmit power which ranges from 250 mW to approximately 2 W for outdoor deployments and 100 mW or less for indoor deployments. Pico cells are used to increase the capacity in the urban areas. For example, in buildings or as a hotspot in a hotel or airport. Femto cells or home base stations (HeNBs) are a smaller low power, short range base station and transmitted power is about below 250 mW. 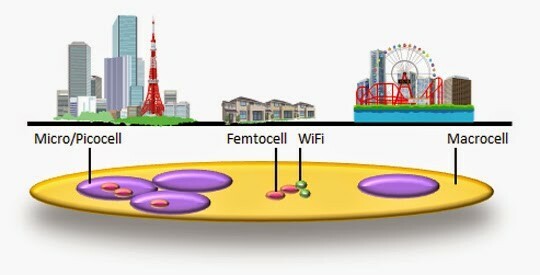 Femto cells are equipped with omni-directional antennas. They are unplanned network nodes and designed for use in home or small business. It connects to the service provider’s network via broadband such as digital subscriber line (DSL) or cable modem. There is no operator deployment.